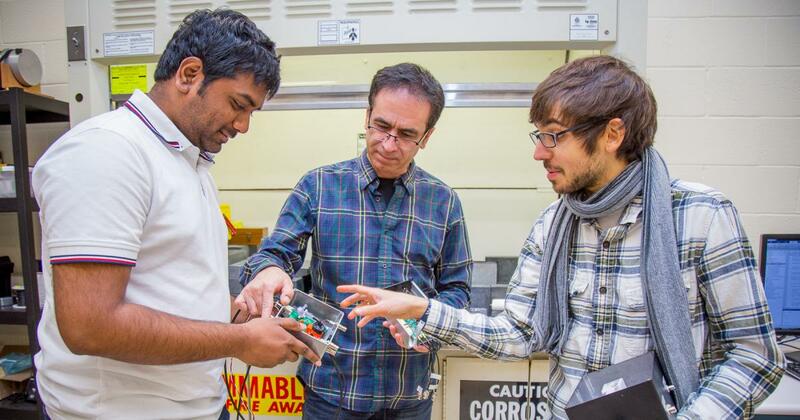 Harish Gadey, Abi Farsoni, and Steven Czyz show off their radioxenon detector. JENS ODEGAARD: That clip was from National Public Radio on Sept. 3, 2017. Stories like it always make me wonder, who’s actually responsible for keeping an eye on countries who try, or actually succeed at testing nuclear weapons? At the international level, there’s the Comprehensive Nuclear-Test-Ban Treaty Organization, or CTBTO for short. It was founded in 1996 and is responsible for what the organization calls the verification regime enforcing the Comprehensive Nuclear-Test-Ban Treaty, or just CTBT. The CTBT has been signed by 183 nation states. Now, verification regime really just means the monitoring and inspection system that, and I quote, "is designed to detect any nuclear explosion conducted on Earth – underground, underwater or in the atmosphere. The purpose of the verification regime is to monitor countries’ compliance with the CTBT which bans all nuclear explosions on the planet.” That’s the end of the quote. So when you watch the news, or hear the radio report about a suspected nuclear test in North Korea for instance, it’s this CTBTO that’s responsible for determining if it was an actual nuclear test as opposed to just a big earthquake or a conventional munitions test. But that’s all still high level, like, who, as in actual people, is doing the work? I’m Jens Odegaard, your host today, and I want you to meet a few people, and hear from them personally about how they’re trying to keep the world safe in an era where we’re seeing the return of the “my nuke is bigger than your nuke” rhetoric of the Cold War. SARA POZZI: Okay, my name is Sara Pozzi. I'm a professor of Nuclear Engineering and Radiological Sciences, and I'm also the Director of the Consortium for Verification Technology. ODEGAARD: Sara’s from the University of Michigan, so first things first. What is the Consortium for Verification Technology or CVT? POZZI: So the Consortium for Verification Technology is a group of 12 universities and nine national laboratories working together to develop new technologies for nuclear treaty verification. And uh,.the Consortium works to develop the new technologies but also to develop expertise in terms of students that are trained in the areas of interest, which include technology and policy for treaty verification. And the idea is to train these students so that they can then get jobs in the field of nuclear non-proliferation. ODEGAARD: The CVT is funded, to the tune of $25 million over five years, by the United States’ National Nuclear Security Administration. Though the U.S. does have one of the world’s largest nuclear arsenals, and has tested and used nuclear weapons in the past, there is a concerted effort to avoid doing so again. and that race to make that first weapon, where we had Nazi Germany on one side and then the United States on the other side. The United States, I should say fortunately, made the weapon first and got that capability. And the years following that, and during the Cold War, we had a development of nuclear powers; we had five nuclear powers that had weapons. But after that it became clear that this technology was very dangerous technology, and so we had to control it. And one of the efforts that was done to control the spread of nuclear weapons was the non-proliferation treaty, which said that these five weapons states would not transfer the knowledge to any other state. And other states, non-nuclear weapons states, would not seek to build a nuclear weapons capability. And the supporters of the non-proliferation treaty would say that it's been successful overall. ODEGAARD: The CVT fits into these efforts to support the Comprehensive Nuclear-Test-Ban Treaty and its International Monitoring System, which will be explained in just a minute. Oregon State is one of the 12 universities that make up the consortium, and researchers from the Radiation Detection Group in the College of Engineering are working on ways to help verify nuclear weapons tests. The Radiation Detection Group is led by radiation health physics associate professor Abi Farsoni. Here he explains how the International Monitoring System helps catch the hand in the cookie jar so to speak. FARSONI: And based on this treaty, any nuclear weapon test is forbidden, so nobody should attempt to test a nuclear device. And so there should be a verification mechanism for those countries who signed the treaty. One of the missions of CTBTO is to establish a verification mechanism. So based on that, they established a system -- it's called International Monitoring System, or IMS -- that has to install stations all around the earth, different countries. These stations should be equipped with sensors, and these sensors just collect the data regarding the any nuclear weapons tests. And then in real time, this data are sent to the headquarters of CTBTO, which is located in Vienna. ODEGAARD: This array of sensors or detectors is extremely important in nonproliferation efforts. Here’s Steven CZYZ, a grad student in the Oregon State Radiation Detection Group. CZYZ: If we don't have the detection array, then there is no incentive to not detonate nuclear weapons if a country's curious or wants that power and they know they can get away with it, then why not. As far as how many bombs have gone off, North Korea's popped off a few. And we've been able to see them with this detection grid. ODEGAARD: Within the CVT, there are six different thrust areas covering a variety of research activities that are all centered around nuclear security and safeguards. I’ve put a link to their website in our show notes for this episode if you want to find out all the details. Oregon State is part of Thrust Area 4, which is focused on the Detection of Undeclared Activities and Inaccessible Facilities. These North Korea tests that Steven was just talking about? Those are what you call an undeclared activity at an inaccessible facility. POZZI: So, we've had cases in North Korea in the past ten years or so, where there have been six nuclear tests; these are underground tests, and we have signatures that come out of those tests, that we can look at to determine first of all, whether or not that explosion is a nuclear explosion, and then try to quantify the yield of the weapon. So this requires looking at seismograms from stations that are around the area, and also looking at radioxenon detection. ODEGAARD: In other words, if a seismic event caused by a suspected nuclear explosion is detected, they can prove it is a nuclear explosion by also detecting radioxenon. Here’s grad student Harish Gadey, another member of the Oregon State Radiation Detection Group, explaining how the radioxenon enters the atmosphere from the underground blast chamber. GADEY: So when a nuclear weapon goes off, it's basically uranium or plutonium. And when there's nuclear fission, there's literally the entire periodic table that's generated during that explosion. So, some of them are solids, some of them are gases. Most of the solids do not escape the blast chamber. So when it comes to gases, they can move up from the chamber and into the atmosphere. Out of all those gases, xenon is kind of important to us because xenon, as we know, is a noble gas. That means it does not interact with a lot of chemicals. So when it enters the atmosphere, that's where we come in and we sample the air and look for different isotopes of radioxenon, to determine if it's coming from a nuclear reactor or it's actually coming from a nuclear medical isotope facility, or if it's a nuclear blast. ODEGAARD: Radioxenon can be detected days after it has entered the atmosphere and thousands of miles away from where it was released. In one instance, radioxenon released from a 2006 test at Punggye-ri nuclear test site in North Korea was detected two weeks later in Yellowknife, Canada, which is 4,454 miles away--and yes, I did Google map that. That’s why it’s so important when it comes to verifying a nuclear test. The Oregon State Radiation Detection Group, is at the forefront of radioxenon detector work at the university level. You can actually find out more specifics about their radioxenon detectors in one of our season three podcast episodes at engineeringoutloud.oregonstate.edu. I’ve also included the link in our show notes for this episode. Anyway, as I was saying, Oregon State leads the charge for radioxenon detection. FARSONI: Our group at Oregon State University is the only university-based research group which has been involved with developing radioxenon detectors, in whole country. ODEGAARD: Oregon State is seeking to improve radioxenon detectors to be more effective and efficient. POZZI: So, the work that's been done at Oregon State seeks to improve the current, currently available radioxenon detectors and to make them more sensitive to miniscule quantities of radioxenon that are emitted in the atmosphere. And the impact of the work is that if a better detector can be developed and deployed, then we can more accurately determine whether that explosion was a nuclear explosion or a conventional explosion. So, radioxenon is really a fingerprint of the nuclear explosion. ODEGAARD: These miniscule quantities of radiation, used to verify that the North Korean tests really were nuclear, are at a scale that’s hard to fathom--even for these researchers who are deeply involved in the work. FARSONI: And our research, our results from our measurements show that the performance of the devices are good to be used as real detectors in these stations. Because there is a threshold, that's set by CTBTO for sensitivity of these systems. They said these detectors should be able to detect at least one millibecquerel per cubic meter of air. And our experimental results show that the detectors that we developed show sensitivity even better than that sensitivity that is set by CTBTO. ODEGAARD: Harish or Steven, do you either of you have an analogy or metaphor to help picture what, what was it, one….? FARSONI: One millibecquerel per cubic meter. CZYZ: Um, oh gosh. Well, one millibecquerel per cubic meter is like one decay per every thousand cubic meters of air, so. CZYZ: Yeah, like what would be a good analogy for that? I don't know. It might be like, look at all the sand on the entire West Coast, and then like, we can detect a single grain of sand being, like, nudged a little bit. GADEY: Per second, again. It's phenomenal. This thousand meter cube has a lot of atoms. But looking for the one xenon decay, I mean, that's the state-of-the-art we're at right now. GADEY: Um, okay when I say decay, imagine a person can hold, like, six footballs together. Like, what if I give you three more footballs - would you be able to hold them? Maybe yes, maybe no. If you're able to hold them, I'll give you ten more. There is a threshold where you're going to drop a few, so that is something called a decay, more or less. And when you decay, the footballs go down and they bounce around, so that is kind of like the radiation.That's what we're trying to detect. ODEGAARD: I love people like Steven and Harish who can break it down from millibecquerals, to sandy beaches, to football, for someone like me who majored in something less STEM-like and more liberal-arts like. The point being, the radioxenon detectors they’re building here at Oregon State, have the capabilities to work in real-world scenarios. And they cost a lot less than current technology. FARSONI: Right now, the price for one device, one radioxenon detector, for CTBTO, is $1,000,000. ODEGAARD: The $1 million figure for the current technology is split between $500,000 for the air sampling system which extracts xenon gas and brings the sample into the detector, and the detector itself, which also runs $500,000. In contrast, Abi estimates the detectors being developed here at Oregon State would cost between $20,000 and $50,000. They’re so much cheaper because they use different detection materials and and because the electronic components are developed here in house rather than bought at retail prices. Once again, I’ve put a link in the show notes to the Radiation Detection Group website, where those of you who are so inclined can read up on the technical details of these materials and components. Now, there’s a very real possibility that these innovative detectors could indeed move from the university level all the way up being implemented in the actual International Monitoring System. That’s because the CVT has already produced similar results. POZZI: So within the CVT, we have several examples of projects that are making an impact in the field, both within the national lab system, and also outside of the national lab system. And, one example is the development of a detector that is used to analyze the amount of fissile material in a sample. So, fissile material is the material that makes a nuclear weapon so destructive. We call it "special nuclear material." It's the core of a nuclear weapon. And, it can generate a nuclear explosion. So, that includes plutonium-239, and uranium-235. ODEGAARD: This detector, which they call the Fast-Neutron Multiplicity Counter, was developed at the University of Michigan and is going to be used by the International Atomic Energy Agency or IAEA. POZZI: And we are working together with the IAEA to make it available to inspectors around the world. It's going to be the next generation of detectors for measuring fuel. So, you know that special nuclear material can also be used to power commercial reactors for production of electricity, so, we want to make sure that the fuel in these reactors is well-characterized, and there's no diversions in the pins that make up the fuel. So our detector will enable the verification of a fresh fuel for nuclear reactors. ODEGAARD: University-level research through consortiums and partnerships like the Consortium for Verification Technology are super important to developing these new, better technologies. POZZI: The universities have a specific role to play in terms of research and development efforts that is complementary to the research and development going on at national labs and in industry. So within the university, we have freedom to explore topics that are maybe a little bit higher-risk, but could be potentially a bigger payoff compared to other projects, so we can get students excited about some of these topics and get them involved in some of these projects that will benefit the nuclear non-proliferation mission space, which is to prevent the spread of nuclear weapons technology around the world. ODEGAARD: As Sara just mentioned, student involvement works hand in hand with the development of these new technologies. CZYZ: The Consortium for Verification Technology, in an effort to kind of make these scientists, they recognize that these scientists in the making need to eat, so they are, you know, helping fund our education through this, so that we can become scientists in the system. In the national labs and stuff. ODEGAARD: Steven and Harish both have funding from the CVT for their graduate studies. Steven is fully funded as a CVT fellow, and Harish has partial funding as a CVT associate. Harish plans to work at a national lab back home in India after he graduates. Steven, on the other hand, he wants to stay in academia for the creative freedom to explore high-risk topics. we have deadlines, we have things that we need to produce, but it's recognized that universities are also a learning space, and it's a space for innovation. So, at this level, not only is this teaching going on, but you're also being able to ask these questions, like, "Well, what about--maybe we should try this. Maybe we should do this." I'm really grateful that the CVT has given us the opportunities that we have, you know? They're paying for our school, and they're funding all of these projects to make the world a safer place. And I think that's really fantastic. ODEGAARD: I think it’s fantastic too. And it’s definitely nice to know some of the people helping keep the world a safe place by using their fantastic intellect and engineering skills developed over years in classes and labs. I hope you’ve enjoyed getting to know Sara, Abi, Steven, and Harish as well. Because for every dictator and nuclear button braggart, there are a lot more good people like them who are focused on facing the challenges we created in our past and moving beyond them. This episode was produced and hosted by me, Jens Odegaard. Audio editing was by the awesome Brian Blythe. Our intro music is “The Ether Bunny” by Eyes Closed Audio. You can find them on SoundCloud and we used their song with permission of a Creative Commons attribution license. Other music and sound effects in this episode were also used with appropriate licenses, and you can find those links on our website. For more episodes, including Season 3, Episode 2--which goes into more detail about our radioxenon detectors, visit our website engineeringoutloud.oregonstate.edu. Also please subscribe by searching “Engineering Out Loud” on your favorite podcast app.